66% of internet users look online for information about a specific disease or medical problem. The percentage of internet users who look for information about a specific disease or medical problem has remained the same over the past six years. 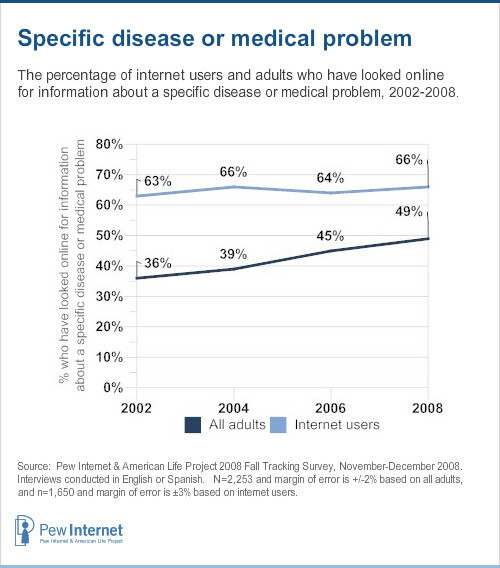 In 2002, 63% of internet users looked online for information about a specific medical problem, and, in 2008, 66% did so. This increase is not statistically significant. Whites (68%) are more likely than African Americans (60%) or Hispanics (55%) to research online about a medical problem. Internet users age 30-49 (71%) and those age 50-64 (67%) are significantly more likely than the young internet users (61%) and wired seniors (53%) to turn to the internet for information about specific medical problems. Those making $50,000 or more a year are much more likely than those making less than $30,000 a year to look online for disease-related information. Similarly, internet users with some college education (70%) and college graduates (76%) are significantly more likely than high school graduates (55%) and internet users with less than a high school education (49%) to look online for information about a specific disease or medical problem. Internet users with a college degree were the only demographic group to become significantly more likely than they were six years ago to search for disease-related information online.